Well-acclaimed for the exquisite range of wildlife species, Bandhavgarh National Park India is located at a distance of 195 km from Jabalpur and at a distance of 210 km from Khajuraho in the state of Madhya Pradesh. Also known as the jewel in the wildlife legacy of Madhya Pradesh, Bandhavgarh is quite popular for the Royal Bengal Tigers, cheetals, leopard, gaur, sambhar, and many more animal species. Bandhavgarh Wildlife Tours embrace the most exotic locale and amazing range o wildlife species wandering carefree in their natural abode. The park is nestled in the Vindhya mountain range of Central India and abounds in hills and ravines. Although it is small in contrast to Kanha or other parks of the state, the park is the home to almost the same number of tigers or any other wildlife animal. Besides, tigers and leopards, Bandhavgarh is also exceptionally productive for medium-sized bison herds. The Wildlife Tourism in Bandhavgarh is burgeoning at a rapid pace and each year a large number of tourists from all corners of the world frequent this park to seek seclusion and peace amidst the true lap of nature. The kind of vegetation that is found here is moist deciduous forest just like the one in the Kanha National Park. At higher elevations, the flora consists of general mixed forests. For the ardent nature lovers and wild life enthusiasts this sanctuary is one of the most important ones and makes for interesting wildlife photography. 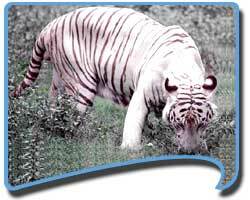 There is also the white (albino) tiger which is found here. A range of other rare species moving around in Bandhavgarh National Park like sloth bear, gaur, sambar, chital, muntjac, nilgai, chinkara, and wild pigs can also be found. The fascinating cave shrines scattered around the park can also be spotted having Brahmi inscriptions dating back to the first century B.C. Moreover, the remains of the Bandhavgarh Fort that are believed to be 2,000 years old are also found here. Make your trip to Bandhavgarh one of the most memorable ones by being a part of the attractive tour packages that are designed by touristplacesinindia.com. Keeping the individual tastes and preferences in mind, the packages are designed to impress even the most discerning traveler. The all-inclusive packages are your ticket to a completely enthralling journey into the wilderness of nature and to enjoy the riches of nature. Since Bandhavgarh National Park is the repository of exquisite wildlife and some of the finest historical remains, it automatically becomes inevitable for the tourists to make a tour of this place. The ceaseless charm and magnificence of this wild territory is definitely going to enchant you. Touristplacesinindia.com offer online information on Bandhavgarh and the wildlife tourism in the park.